A Sound of Thunder Pics from Baltimore Comic-Con! Some of us here at Maximum Metal are lifetime members of what we call the "MCW Triad" of media enjoyment--metal, comics, wrestling. 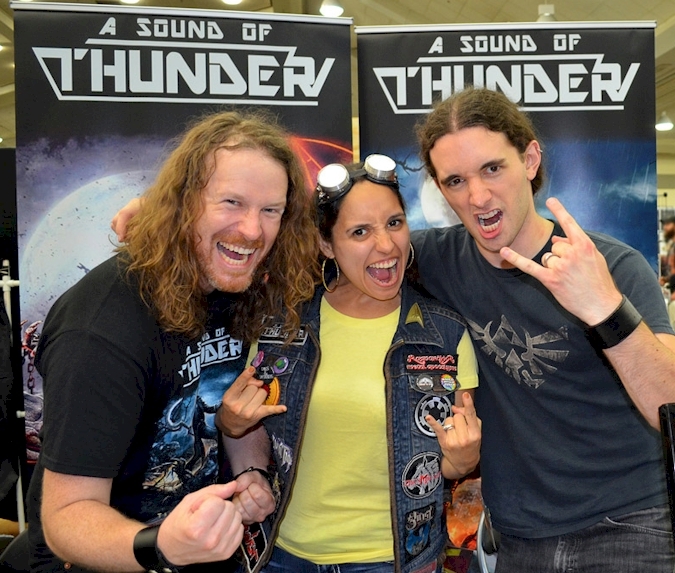 At the end of September, we sent one of the MM crew out to the Baltimore Comic-Con to visit with traditional metal band A SOUND OF THUNDER who first hit our ears with the 2014 release The Lesser Key of Soloman and the hit animated video for the song "Udoroth". Utilizing a Kickstarter campaign that raised $30,000+ (triple what they asked for), ASOD have teamed up with comic producer Valiant Entertainment to release "Tales from the Deadside", their new album based on the book "Shadowman". This week the new album debuted at #8 on the Billboard Heatseekers Albums! Tales from the Deadside was recorded at Assembly Line Studios with RIAA platinum-awarded producer Kevin '131' Gutierrez (Shinedown, While Heaven Wept, Raven), the album tells the story of Shadowman, one of the flagship characters of Valiant Entertainment's comic book universe.